Join us for an exclusive celebrity red-carpet event and fashion show, highlighting evening and cocktail wear that will be trending for the events industry in 2019. The evening will feature designs by Noell, Shail K, and Leehwa Wedding. 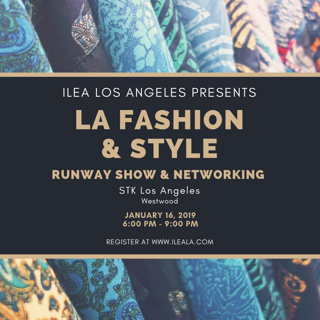 After the energetic and fashion-forward show, mix and mingle with fellow ILEA LA members and new friends, while sipping on delicious cocktails at LA’s most chic and intimate ambiance of STK LA. We’ll see you on the runway! © 2018 ILEA Los Angeles All rights reserved.